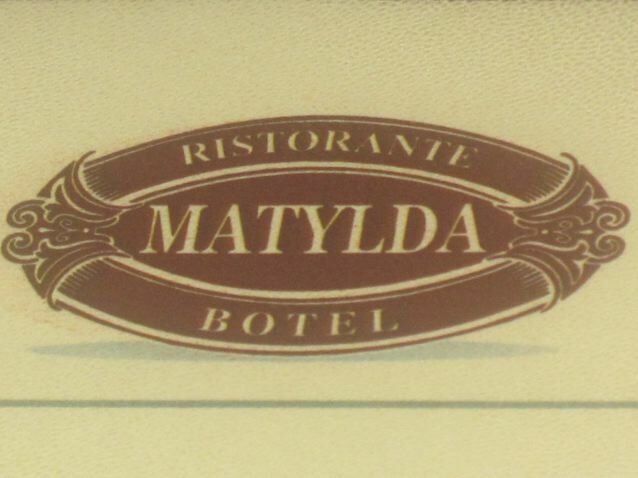 Ristorante Botel Matylda has been floating around in my mind for a couple of years. It's been that long since colleague a told me about an enjoyable dinner there. Curly said she wanted to go out, and I decided a beautiful boat on the Vltava would be a good choice. The recent post on Knedliky Etc. put it back on my radar screen more recently. 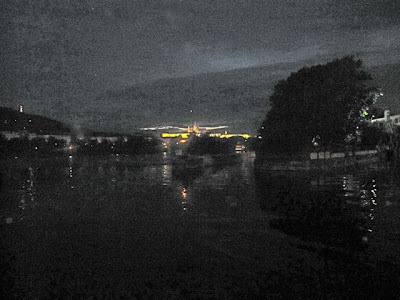 Located near the Dancing House, it has a prime, if not very visible location. It's not so easy to see from the road. But the restaurant does offer some great views, which are even better now in warm weather with the addition of a floating deck. I got there first and really liked the boat's inside dining area. With its dark, stained woods and low lighting, it had a romantic, intimate atmosphere. My pleasure with the atmospherics was clouded by the news that our reserved table on the boat's fantail wasn't ready. It would be another 10 minutes. I was given a menu and a table and asked to sit and wait. It's a good thing Curly is always late. But I found it nearly impossible to read the menu in that dim spot without holding it right next to a candle. Finally, the table on the fantail was ready and Curly showed up shortly afterward. In good weather, it's really a lovely place to sit. 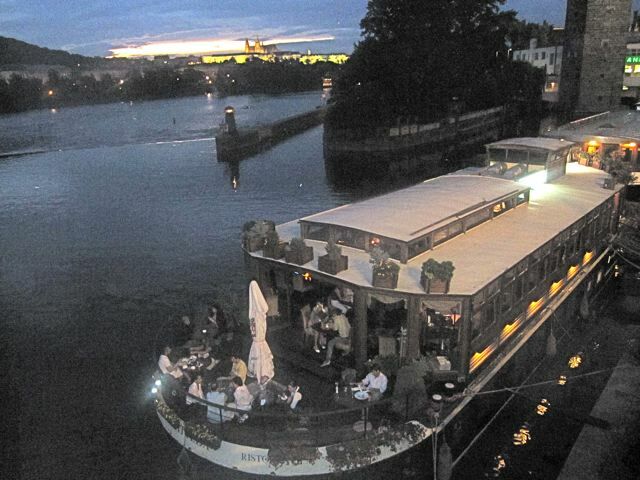 Our table even had a direct view of Prague Castle. But again, an ill wind blew. We had no menus, and there was no candle on our table. I asked for one when we were seated, but the waiter disappeared. Eventually, I went back inside, walked across the dining room, and took the menus from the table I started at. Then, I took a candle off a nearby empty table. 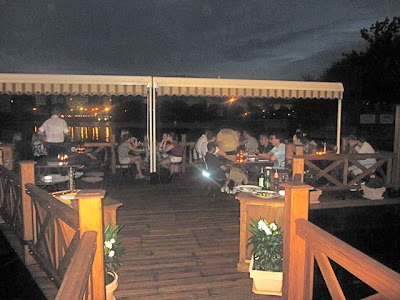 The lapses surprised me because Miss Knedlikova reported that she enjoyed perfect service. I ordered a half-liter of beer. 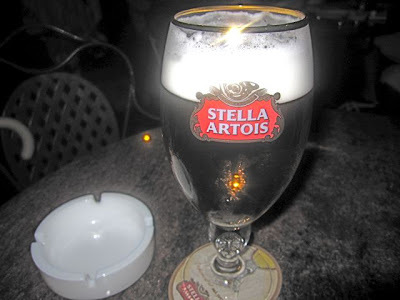 They have Stella Artois (65 CZK). Not my favorite, but it would have to do. Curly had a .2 liter glass of Rulandské bílé (75 CZK). 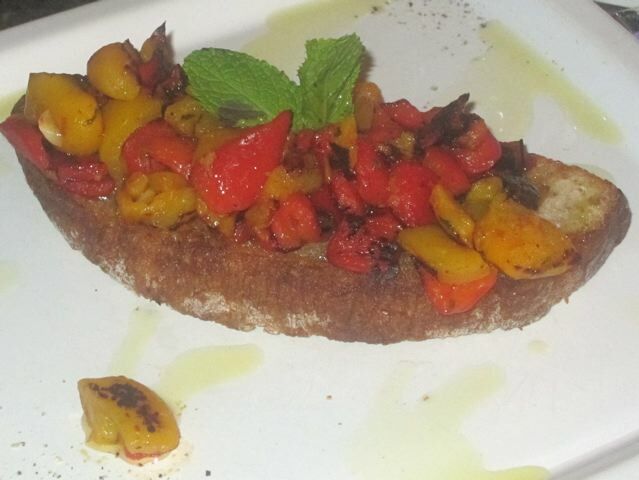 For starters, we shared the bruschetta with roast peppers, shallot and mint (99 CZK). It was just OK. The peppers were cooked to just the right level of softness, and the bread was tasty, fresh, and chewy. But the only flavor really evident was that of peppers and olive oil, which thoroughly soaked the bread. I didn't really taste the shallots and or the mint, aside from the ornamental leaves on top. I also ordered the risotto with prawns, tomatoes, and olive purée (195 CZK). This dish sank in my esteem for a number of reasons. The overcooked grain tasted more like plain rice than risotto. 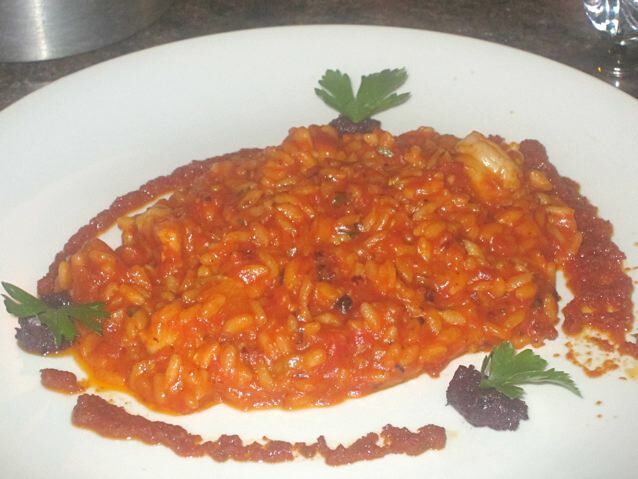 The "tomatoes" were more like a straight tomato sauce mixed liberally with the rice. It was rather boring, but when the olive purée from around the side of the dish was stirred in, it livened it up nicely. I was about to declare the dish a real failure, but then I took a bite of a prawn. It was amazing. The perfectly cooked, tender crustacean had the sweet, complex flavor of a quality prawn cooked in the shell and then carefully removed before serving. I enjoyed each bite of those. It had me wanting to return to try their grilled tiger shrimp main course (385 CZK). 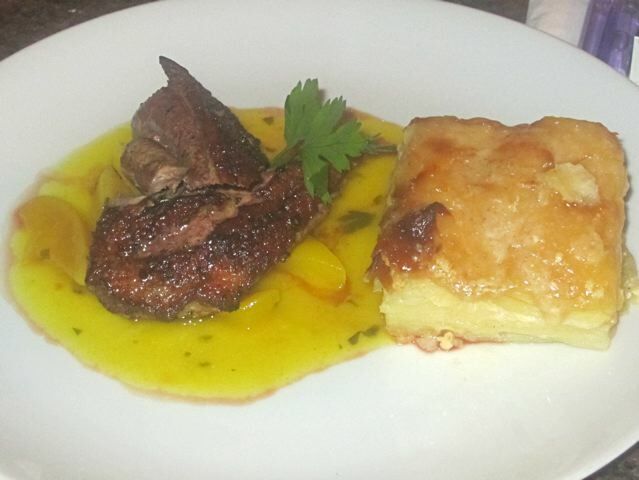 For a main course on this visit, Curly got the breast of duck with marinated pear in Drambuie (325 CZK). She also had potatoes au gratin on the side (55 CZK). We were both disappointed with this dish. The duck was pretty, but dry. The pear and sauce were just sweet, and didn't add any other dimensions. I didn't really taste the Drambuie. 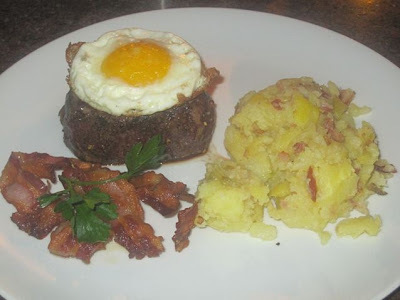 I ordered the "beef steak with roasted pancetta and poached egg. "(495 CZK). On the side, I got mashed potatoes with shallot (40 CZK). The meat itself was tender, peppery, beefy, and delicious. It was a good steak, properly cooked. The buttery mashed potato, with pieces of pork mixed in, was very enjoyable. But I put the menu description of this dish in quotes for a reason. Roasted pancetta? It was overcooked, brittle, and looked like ordinary bacon strips. A poached egg? In my book, what I received was an egg cooked sunny side up. It was so overcooked, the yolk wasn't even runny at all. For dessert, I also had to try what they call the chocolate pinnacle with morello cherries (95 CZK). We both loved this. The thick, sugary, white filling sat between impossibly moist pieces of chocolate cake. 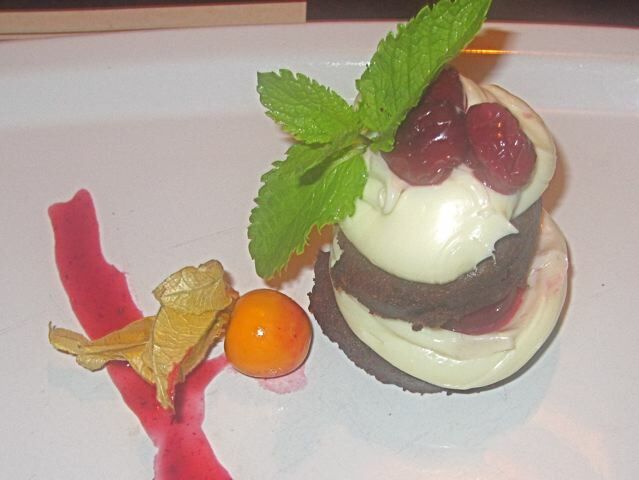 The sweetness was balanced out with tart, juicy black cherries. 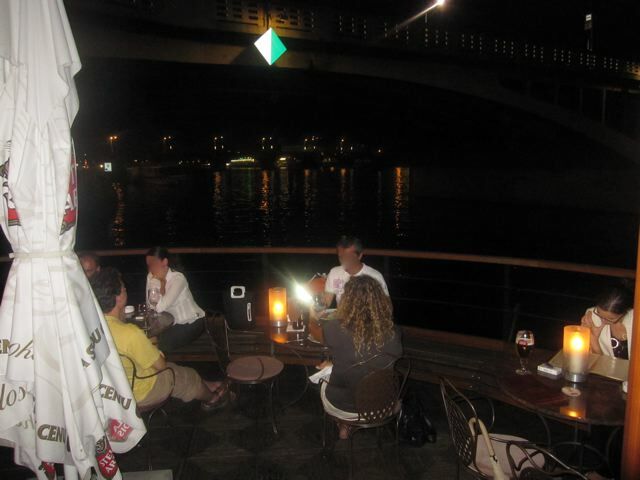 Throw in another beer, a couple of bottles of water (35 CZK each), and the total bill was 1579 CZK without tip. 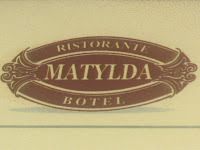 My take on Ristorante Botel Matylda is this: It is a beautiful ship in a beautiful spot. 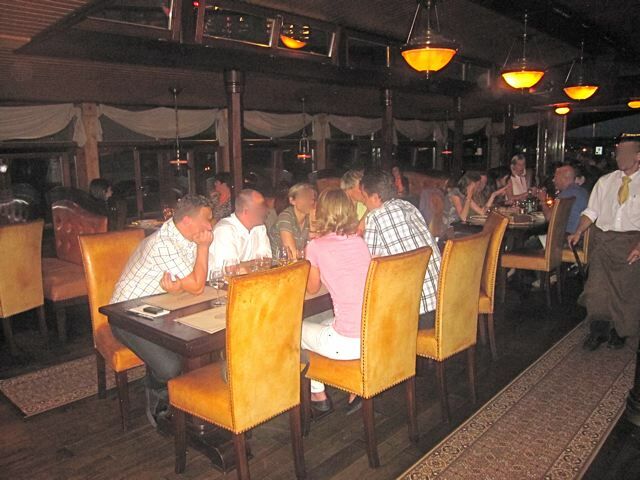 The dining room has style and atmosphere. When navigating through the menu, the descriptions of the dishes sound creative and delicious. But it seems that when it comes to execution, they are not trying hard enough. This restaurant is not cheap, especially with side dishes costing extra. And all too often, when it comes to the most important factor, how the food actually tastes, this place often misses the boat.